Canyon View and Sunrise Point are two small neighborhoods that offer residential building sites and homes. With some big views down into the river canyon, the area is both quiet and private. 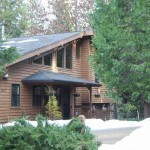 The Stanislaus National Forest ranger station is located here as well. It’s an ideal year-round elevation that typically has less snow than up the hill in Arnold and has an estimated elevation of about 3,400’.